Swatch pack of the Natural colour A4 computer paper range; mini sheets (4 inch by 3 inch) of the Natural colour computer paper range, printed with the name of the paper so that you can check the colour, paper texture and print appearance before you buy packs from the range. This pack contains 1 mini sheet each of the papers in the Natural colour A4 computer paper range, approximately 15 sheets in all (a selection of colours are shown in the photo above). 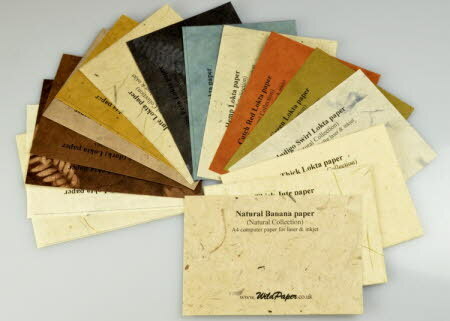 The papers include Pomegranate Fern Leaf, Indigo, Jute, Indigo Swirl, Cutch, Hemp, Aspen, Festival, Walnut and Banana papers and Natural Lokta paper. The printer papers have a smooth calendered top surface and a slightly less smooth reverse surface. We suggest that you use this paper one sided in laser printers but you can use most of them two-sided printing in inkjet printers.